Bugatti is an exceptionally well bred and highly graded mare. She was awarded Keur status at her grading, scoring highly on all three gaits. Following a very successful performance test and completion of the strict KWPN X Rays she has now been granted ELITE status! Her breeding is impeccable, with line breeding to the legendary Donnerhall and a blue chip dam line. Every mare is graded ELITE and has the Sport dressage predicate too. This exceptional quality of the dam line is truly outstanding. I am so pleased to welcome this special mare into the herd. She is so beautiful, kind and gentle with the most amazing hind leg I have ever seen. All three of her paces are spectacular. 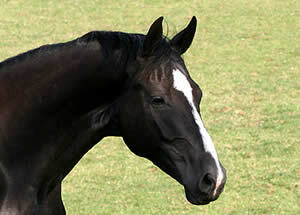 Discovery is a stunning black stallion with three powerful gaits. He completed a very successful performance test scoring 9 for type, 8 for trot and 8 for canter. Discovery has a strong hind leg, a beautiful use of the front leg and is very easy to ride with great rideability. His father Dolany is a son of the legendary stallion Donnerhall, who is also the father of Don Schufro and Don Primero. Donnerhall is one of the World’s best dressage stallions. Dolany came 3rd at the German Bundeschampionat and with Discovery he produces an approved stallion out of his first breeding year. In the dam-line we find the stallion Lorentin I, also a famous Holsteiner dressage stallion who is competing at Grand Prix level. Also his offspring are doing very well as he already produced some approved stallions: L’Acteur and Limancello. The dam-line of Discovery is a line with a lot of performance. For example, some famous horses out of this line are Operette la Silla, Lantaan, Literat and Clintino. Bugatti's dam Vienna was successful in dressage competing to such a high level she was awarded the prestigious Sport predicate by the KWPN. She is also an Elite mare. her mother and her mother's mother are also all Elite mares and have the Sport dressage predicate. Vienna's sire is the famous Blue Hors Don Schufro by Donnerhall. Don Schufro is an Elite stallion, Danish Champion and Olympic bronze team winner in Hong Kong! Don Schufro continuously produces top results. In 2010 his progeny made the headlines time after time. His daughter UNO Donna Unique became 6-year-old World Champion in Verden and Danish Champion in Odense, a son of Don Schufro became licensing champion in Oldenburg and the 7-year-old dressage champion in Falsterbo 2010 was Dejavu ridden by Patrik Kittel. Don Schufro has won World Cup qualifications and has over 30 victories and many placings in Grand Prix at the most prestigious shows like Aachen, Bremen, Wiesbaden, Lingen, Neumünster and Nörthen Hardenberg. His career highlight came in 2008 when he became Danish Champion and won team bronze at the Olympic Games in Hong Kong. Individually he placed 11th. At the world championships for young horses in Verden 2009 Don Schufro was either sire or grand sire of the four Danish horses that all made it to the final. In Verden 2010 Don Schufro was either sire or grand sire of five of the nine best horses! In the final for 6-year-olds he was the sire of the champion UNO Donna Unique, No. 4 Rebelle and dam sire of No. 5 Skovens Rafael. Don Schufro still tops the German breeding value with a dressage index of 171 (No. 2). He has sired more than 20 licensed sons, two of his daughters have been Champion Mare in Oldenburg and three Daughters of Don Schufro have been Champion Mare in Denmark. Four daughters have been awarded the highly coveted gold medal. Bugatti's maternal grand sire the Preferent stallion Flemmingh, was one the most famous dressage stallions in the KWPN. The Preferent predicate is the highest award the KWPN can give which demonstrates just how outstanding Flemmingh was. He placed third at his performance test in 1990, scoring three 9s, including a 9 for jumping. Flemmingh is the sire of Anky van Grunsven’s now retired Grand Prix horse Krack C, as well as Cathy Morelli’s BeSe, and Imke Schellekens-Bartels’ Melvin, among many other notable dressage horses and numerous ster and keur mares. Flemmingh’s offspring are big moving, tall, athletic, and long lined horses with three excellent gaits and an outstanding temperament. He is known for passing on the “knee action” that makes his movement so appealing as well as the wonderful temperament.